Background: p53 mutations are frequently observed in colorectal carcinomas but they have also been found in colorectal adenomas, although considerably less frequently. Aims: To explore p53 mutations in benign tumours, we have screened 70 colorectal adenomas for allelic loss at, and point mutations in, TP53 by analysis of selected microdissected cell populations. Results: Sixteen (22.8%) adenomas were found to have allelic loss, of which 11 (15.7%) had p53 mutations. In adenomas with mild, moderate, or severe dysplasia, mutation or allelic loss occurred in 4.8%, 16.7%, and 52.6%, respectively (p<0.001). Seven different mutations were found, all missense changes or inframe deletions: one (Thr150Arg) has not been found before while three (Gln144His, Gly245Arg, and Glu285Gln) have not been described previously in colorectal tumours. The other three mutations (Arg175Gly, ΔPro190, and Gly245Ser) have been found in colorectal carcinomas, the last commonly. Adenomas harboured a spectrum of p53 mutations which was significantly different from cancers as regards the position in the gene and a higher frequency of G→C/C→G changes. Conclusions: Combining our data on adenomas with data already published and in comparison with the spectrum of mutations in colorectal carcinomas, it is suggested that some p53 mutations have a weaker effect than others and are therefore more likely to be found in adenomas which have not progressed to carcinomas. The p53 protein plays a pivotal role in modulating cell growth, division, and apoptosis. Mutant p53 may contribute to increased cell proliferation, loss of ability to undergo apoptosis, and increasing genetic instability.1 Inactivation of p53 has been found in a wide variety of malignant tumours, including colorectal cancers, where it is generally believed to be critically involved in the transition from adenoma to carcinoma.2,3 Using immunohistochemistry (IHC), we and others have found nuclear accumulation of p53 protein in colorectal adenomas with moderate and severe dysplasia,4–6 raising the possibility that not all p53 mutations which occur in adenomas necessarily lead to rapid or inevitable progression of the tumour to malignancy. However, it is possible that accumulation of p53 in these cases may involve unusual mechanisms, without promoting malignancy. To further explore the nature and significance of TP53 mutations in colorectal tumours, we have studied mutations in and LOH at TP53 in a large series of adenomas previously analysed by IHC6 and then, combined with published data, compared the findings in adenomas with those in carcinomas. Our results show that the spectrum of TP53 mutations in adenomas is different from that in carcinomas, thus leading to the conclusion that, in those cases, it is TP53 mutations per se which cause or are permissive for malignant progression. In p53 IHC positive tumours, p53 positive cells were specifically microdissected from lightly stained haematoxylin and eosin slides by comparison with immunostained slides. For the p53 IHC negative tumours, areas of dysplastic cells were microdissected from lightly stained haematoxylin and eosin slides. In both IHC positive and negative tumours, cells were also microdissected from histologically normal mucosa. The microdissected cell populations were digested in 100 μl of 1× polymerase chain reaction (PCR) buffer without magnesium (Promega Corporation, Madison, Wisconsin, USA) containing 200 mg/l proteinase K, for 24–48 hours at 55°C. Proteinase K was thereafter inactivated by heating to 96°C for 10 minutes, the cell debris pelleted by centrifugation (12 000 g for five minutes), and the supernatant used for PCR. As the majority of TP53 mutations occur at conserved regions in exons 5, 6, 7, 8, and 9,14,15 these exons were amplified by PCR (exons 5, 6, and 7 separately, exons 8 and 9 in one amplicon), and mutations screened for by single strand conformational polymorphism (SSCP) analysis.7 For reliable amplification using DNA extracted from formalin fixed and wax embedded tissues, a touch down thermal cycling programme with hot start was employed, and PCR was carried out for 46 cycles of amplification. Each cycle consisted of 94°C for 60 seconds, an annealing step at a variable temperature for 60 seconds, and an extension step of 72°C for 45 seconds. For the first cycle the annealing temperature was 60°C, reducing to 59°C in cycle 2, 58°C in cycle 3, 57°C in cycles 4–7, 56°C in cycles 8–11, and 55°C in cycles 12–46. Cycling was preceded by an initial denaturation step of four minutes at 95°C, and followed by a final elongation step of five minutes at 72°C. PCR products were analysed by SSCP using a temperature controlled semidry electrophoresis machine (Genephor, Pharmacia, USA) utilising dedicated precast 12.5% polyacrylamide gels (GeneGel Excel 12.5) as directed by the manufacturer. PCR products were combined in pairs, either exon 5 plus exon 7, or exon 6 plus exons 8+9, and then diluted and denatured according to the instructions; the equivalent of 0.5 μl of each individual PCR product was loaded per lane. Electrophoresis was performed for 60 minutes at a constant 900 V; all samples were analysed twice, once at 5°C and a second time at 20°C. The gels were silver stained according to the manufacturer's recommendations, and viewed by two observers (XPH and IMF) to maximise the efficiency of mutation detection. Exons in which mutations were putatively identified by SSCP were sequenced using an ABI PRISM 377 fluorescent DNA analyser (Perkin-Elmer Applied Biosystems, Foster City, California, USA). Dye deoxy terminator ready reaction mix (Perkin-Elmer Applied Biosystems) was used according to the manufacturer's instructions and using an annealing temperature of 51°C for five seconds. Results were analysed by three observers (XPH, IMF, and IPMT) using Sequence Navigator software (Perkin-Elmer Applied Biosystems). The χ2 test or Fisher's exact test (two sided) was used to determine the statistical significance of associations between the molecular and clinical data. The χ2 test, on loge transformed data with Pearson's correction, was used to determine the log likelihood ratio for the comparison of mutational position in the different tumour types. For comparison with previously described somatic TP53 mutations, advantage was taken of the IARC database of p53 gene mutations in human tumours and cell lines (http://www.iarc.fr/p53/homepage.htm). Version (R1) was imported into Microsoft Access for Windows 95 (v7.00). Adenoma data were also gleaned from the p53 Data Base (http://perso.curie.fr/Thierry.Soussi/), care being taken to eliminate entries duplicated on both databases. For determination of TP53 mutation frequencies in colorectal carcinomas, data were excluded from tumours other than adenomas or carcinomas (for example, carcinoids), cell lines, familial cases, silent mutations, and mutations in exons 1, 2, 3, 4, 10, or 11. The results of the p53 mutation screen and LOH analysis are summarised in table 1. Eleven adenomas had mutations which in all cases were found together with LOH; thus mutation and LOH were strongly correlated (p<0.001, Fisher's exact test) (table 2). Ten of the mutations were missense changes and one was a 3 bp deletion having the effect of removing one of the two proline residues at codons 190 and 191 (ΔPro190; table 1). Adenoma ICsm1169 was found to have a missense point mutation not previously described in any form of neoplasm (449G→C; Thr150Arg). Another adenoma (ICsm1276) with a missense mutation in exon 7 (Gly245Ser) and LOH had a second sequence variant of uncertain significance, an insertion of AT in place of a G in intron 8 (IVS8+26delGinsAT). Interestingly, in one adenoma (ICsm0824) it was possible to show that both the pattern of LOH and the same mutation (Gly245Ser) were present in three histologically distinct areas, one tubular area with moderate dysplasia, and one tubular and one villous area with severe dysplasia (fig 1). A section from adenoma ICsm0824 with two areas of tubular (left side, severe dysplasia; right side, moderate dysplasia; arrows) and one area of villous (arrowhead) architecture with severe dysplasia. 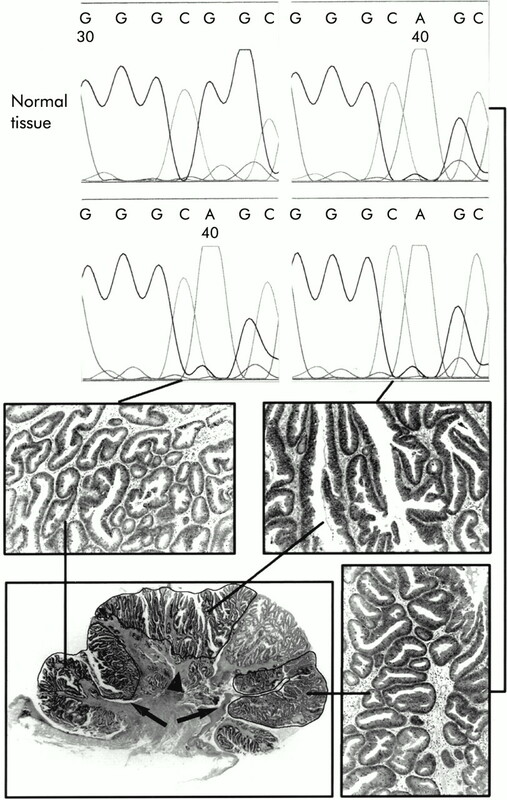 The attached sequencing electropherograms, derived from material microdissected from each area, show that the same TP53 exon 7 mutation (GGC→AGC; Gly245Ser) is present in all three areas. Given the strong correlation between mutations and LOH (table 2), tumours with either of these events were combined in a single group for further statistical analysis. Severely dysplastic adenomas displayed a significantly increased frequency of mutation or LOH compared with those with mild and moderate dysplasia (p<0.001, χ2 test) (table 3) but there was no correlation with size (p>0.25; χ2 test) or histological type (tubular v tubulovillous plus villous) (data not shown). Positive IHC was correlated with mutation or LOH (table 4) but the relationship was not absolute: three IHC negative adenomas and three of eight IHC positive but mutation negative adenomas were found to have LOH. Data available from other studies on TP53 mutations in adenomas (n=22) were combined with our data (n=11) and the sites of the mutations were plotted on a multiple alignment of p53 sequences from human plus seven other mammalian species (details not shown). All mutations observed in adenomas occurred at residues either absolutely or highly conserved. An initial comparison (fig 2) was then made of the combined adenoma data with those available11,12 on p53 mutations in colorectal carcinomas (n=782). 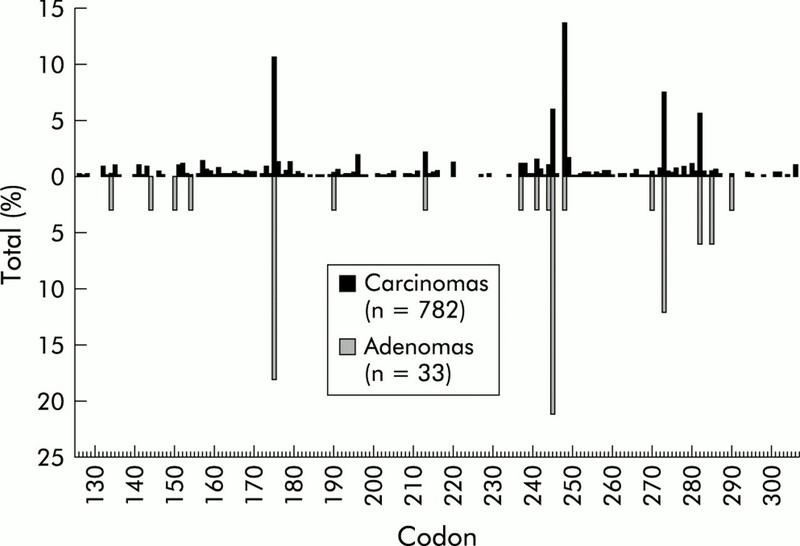 From this it appeared that although the two mutational spectra were broadly similar, there were differences in detail: firstly, the commonest site of mutation in carcinomas (13.8%) at codon 248 was relatively underrepresented in adenomas (3.0%), where instead the commonest site was codon 245 (21.2% v 6.0% in carcinomas); and secondly, in adenomas there were four mutations at the 5` end of the gene (Phel34Ser, G1n144His, Thrl50Arg, and Glyl54Asp) which had been described rarely, if at all, in colorectal carcinomas. Statistical analysis of the frequency of mutations observed between codons 126 and 306 (exons 5–9) at the five commonest sites in carcinomas, plus all other codons between 126 and 306 combined, gave a log likelihood ratio of 0.01, supporting the hypothesis that the mutational spectra differed in distribution (table 5). A third point of contrast became evident when the nature of the mutations occurring at the same codon in both tumour types was considered (table 6). From this table it can be seen that there were frequent differences between the two tumour types; for example, while codon 245 was the fourth most common site in carcinomas, it was the most common site in adenomas because of both overrepresentation of the Gly245Ser mutant and a mutation never seen in carcinomas (Gly245Arg) which was observed in one adenoma. Similarly, codon 285 was an uncommon site for mutations in carcinomas (0.5%) but in adenomas it was a frequent site (6.1%) and, moreover, all because of a mutation (Glu285Gln) only seen in adenomas. Finally, consideration of the frequency of nucleotide changes in adenomas and carcinomas (table 7) showed G→C/C→G changes to be significantly more common in adenomas than in cancers (Fisher's exact test, p<0.00026). The reasons for this excess of G→C/C→G changes are unclear, with no obvious explanation in terms of extrinsic mutagens or intrinsic hypermutability. The frequency of somatic TP53 mutations found in colorectal adenomas (n=33) and carcinomas (n=782) between codons 125 and 306 (exons 5–9), given as a percentage and plotted by codon (data from this study, and Hainaut and colleagues11 and Beroud and Soussi12). Whereas the commonest site of mutation in carcinomas (codon 248) is underrepresented in adenomas, a mutation at codon 245, the fourth commonest site in carcinomas, is the commonest site in adenomas. Mutations at codons 144 and 150 have only been found in adenomas. We have found in sporadic colorectal adenomas that mutations in, and LOH at, TP53 are significantly correlated both with each other and with severe dysplasia. To analyse the mutation and LOH profile in colorectal adenomas, we took care that DNA samples were specifically extracted from microdissected p53 IHC positive cells or from areas of defined morphology in negatively staining cases, thereby minimising possible contamination by non-neoplastic tissues, or mixing of different grades of dysplasia. We found that 52.6% (10/19) (table 3) of severely dysplastic adenomas exhibited mutations and LOH, which is in line with a previously reported frequency of LOH of 45% in highly dysplastic adenomas.19 It also closely matches a frequency of 50–55% which has been reported in carcinomas.3 Together these results show that TP53 mutations frequently occur at the severely dysplastic stage in sporadic adenomas, before the transition to carcinoma. We found one adenoma with moderate and severe dysplasia in two discrete tubular areas and one area of villous histology with severe dysplasia, all showing the same point mutation and pattern of LOH. This clonal homogeneity implies that the TP53 mutation was a relatively early event which preceded the divergence in architecture and grade of dysplasia in this adenoma, and suggests that this histological feature is unrelated to TP53 status, at least in this tumour. Two adenomas with mutations and one with LOH were negatively immunostained for p53, despite our use of a sensitive method for antigen retrieval and the use of the antibody Do-7, which can recognise both wild and mutant p53. Similar findings have been previously reported.7,9 One explanation could be that the half life of mutant p53 may not always be increased enough to permit detectable levels of protein.20,21 Alternatively, p53 protein expression may be transcriptionally modulated by other proteins such as mdm-2. Our mutation/LOH positive but p53 IHC negative tumours may harbour mutations in mdm-2 or related genes. The extent to which mdm-2 influences p53 expression in colorectal neoplasms warrants further investigation. Four adenomas showing positive immunostaining were found neither to harbour mutations nor to show LOH. The explanation for this probably lies in the fact that no single mutation detection technique is 100% efficient, we sought mutations only in exons 5–9, and we did not assess transcriptional silencing of p53. These factors may also explain why we detected LOH at a higher frequency than p53 point mutations (although we cannot exclude the possibility that LOH occasionally targeted a different locus on 17p). Our analysis of the mutational spectra in colorectal adenomas and carcinomas shows that they differ in both site (codon; table 5) and probably also type (amino acid substitution, table 6 and base change, table 7). While it is possible that some bias has been introduced by differences between studies in the mutation detection methods used, SSCP analysis has been frequently used to find TP53 mutations. Similarly, we confined our studies to the most frequently studied exons5–9 and only took published data from the same region; thus any bias caused by differences in methods between studies is likely to be small. Taken together, the data suggest that the TP53 mutation spectra in colorectal adenomas and carcinomas are broadly similar, supporting the notion that most TP53 mutations are directly or indirectly involved in the transition from an adenoma to a carcinoma. That the TP53 mutations seen in adenomas are at amino acid residues either absolutely or highly conserved between mammalian species, and that they are accompanied by allelic loss, provides evidence that they are of functional significance rather than some chance phenomenon. However, we have found notable and specific differences in mutation spectra between adenomas and carcinomas, implying that some TP53 mutations, although conferring a selectable growth advantage, may be either incapable of effecting malignant transformation (at least on their own), or may even be incompatible with it. This hypothesis is supported by recent data from Greenblatt and colleagues22 which suggest that codon 144 mutations affect buried amino acid residues on the non-DNA binding side of the p53 molecule and may have relatively weak effects. Codon 150 mutations moreover have little or no effect in in vitro assays of p53 function,23 suggesting that they too are only weakly selected. An alternative, but perhaps less likely, explanation for our data is that the different mutation spectra might reflect the effectiveness of different extrinsic carcinogens or intrinsic genomic instability in promoting carcinogenesis. Although we recognise that confirmatory data are needed, we suggest, in summary, that some p53 mutations are better than others at promoting (or permitting) progression from colorectal adenoma to carcinoma. We would like to thank Stewart Payne (Kennedy-Galton Centre for Human Genetics, Northwick Park Hospital) for the generous loan of a Genephor machine, Kevin Pack and Victoria Johnson (ICRF Colorectal Unit) for technical assistance, and Graham Clark and Andrew Davies (ICRF Equipment Park) for assistance with the microsatellite and sequencing analysis. This work was supported by the Imperial Cancer Research Fund. Greenblatt MS, Bennett WP, Hollstein M, et al. Mutations in the p53 tumor suppressor gene: clues to cancer etiology and molecular pathogenesis. Cancer Res1994;54:4855–78. Pignatelli M, Stamp GW, Kafiri G, et al. Over-expression of p53 nuclear oncoprotein in colorectal adenomas. Int J Cancer1992;50:683–8. Sinicrope FA, Ruan SB, Cleary KR, et al. bcl-2 and p53 oncoprotein expression during colorectal tumorigenesis. Cancer Res1995;55:237–41. Hao XP, Ilyas M, Talbot IC. Expression of Bcl-2 and p53 in the colorectal adenoma-carcinoma sequence. Pathobiology1997;65:140–5. Kikuchi-Yanoshita R, Konishi M, Ito S, et al. Genetic changes of both p53 alleles associated with the conversion from colorectal adenoma to early carcinoma in familial adenomatous polyposis and non-familial adenomatous polyposis patients. Cancer Res1992;52:3965–71. De Benedetti L, Varesco L, Pellegata NS, et al. Genetic events in sporadic colorectal adenomas: K-ras and p53 heterozygous mutations are not sufficient for malignant progression. Anticancer Res1993;13:667–70. Ohue M, Tomita N, Monden T, et al. A frequent alteration of p53 gene in carcinoma in adenoma of colon. Cancer Res1994;54:4798–804. Yamaguchi K, Sugano K, Fukayama N, et al. Polymerase chain reaction-based approaches for detection of allelic loss in the p53 tumor suppressor gene in colon neoplasms. Am J Gastroenterol1997;92:307–12. Hainaut P, Hernandez T, Robinson A, et al. IARC Database of p53 gene mutations in human tumors and cell lines: updated compilation, revised formats and new visualisation tools. Nucleic Acids Res1998;26:205–13. Beroud C, Soussi T. p53 gene mutation: software and database. Nucleic Acids Res1998;26:200–4. Harris CC. p53 tumor suppressor gene: from the basic research laboratory to the clinic—an abridged historical perspective. Carcinogenesis1996;17:1187–98. Hollstein M, Sidransky D, Vogelstein B, et al. p53 mutations in human cancers. Science1991;253:49–53. Levine AJ, Perry ME, Chang A, et al. The 1993 Walter Hubert Lecture: the role of the p53 tumour-suppressor gene in tumorigenesis. Br J Cancer1994;69:409–16. Jones MH, Nakamura Y. Detection of loss of heterozygosity at the human TP53 locus using a dinucleotide repeat polymorphism. Genes Chromosomes Cancer1992;5:89–90. Cohen D, Chumakov I, Weissenbach J. A first-generation physical map of the human genome. Nature1993;366:698–701. Frayling IM, Bodmer WF, Tomlinson IP. Allele loss in colorectal cancer at the Cowden disease/juvenile polyposis locus on 10q. Cancer Genet Cytogenet1997;97:64–9. Boland CR, Sato J, Appelman HD, et al. Microallelotyping defines the sequence and tempo of allelic losses at tumour suppressor gene loci during colorectal cancer progression. Nat Med1995;1:902–9. Wynford-Thomas D. P53 in tumour pathology: can we trust immunocytochemistry? J Pathol1992;166:329–30. Dix B, Robbins P, Carrello S, et al. Comparison of p53 gene mutation and protein overexpression in colorectal carcinomas. Br J Cancer1994;70:585–90. Greenblatt MS, Chappuis PO, Bond JP, et al. TP53 mutations in breast cancer associated with BRCA1 or BRCA2 germ-line mutations: distinctive spectrum and structural distribution. Cancer Res2001;61:4092–7. Walker DR, Bond JP, Tarone RE, et al. Evolutionary conservation and somatic mutation hotspot maps of p53: correlation with p53 protein structural and functional features. Oncogene1999;18:211–18. Losi L, Ponz de Leon M, Jiricny J, et al. K-ras and p53 mutations in hereditary non-polyposis colorectal cancers. Int J Cancer1997;74:94–6.